But we don’t bring Olive and Artie along on our trips before weighing a bunch of factors first. Below are some tips travelling pet owners should consider before deciding to bring their pet with them on vacation! Lots to consider before taking your dog travelling with you! Here we are at the Delta Edmonton South! Factor in the type of pet you have. Is your pet used to travelling with you? Is your pet used to staying in different/strange places? Is your pet well-trained (potty-wise) and you’re sure there won’t be accidents? Is your pet used to staying in his or her kennel when you have to leave them alone for a few hours at a time – will they be okay? Are they anxious? Some pets are perfectly fine at home and for their health (and yours- stress wise) your trip might be better sans pets. You have to feel assured your pet is going to be comfortable enough staying in a hotel. If you’ve never done it, but feel the personality fits, then try to ease your pet into it slowly. Maybe start with camping! 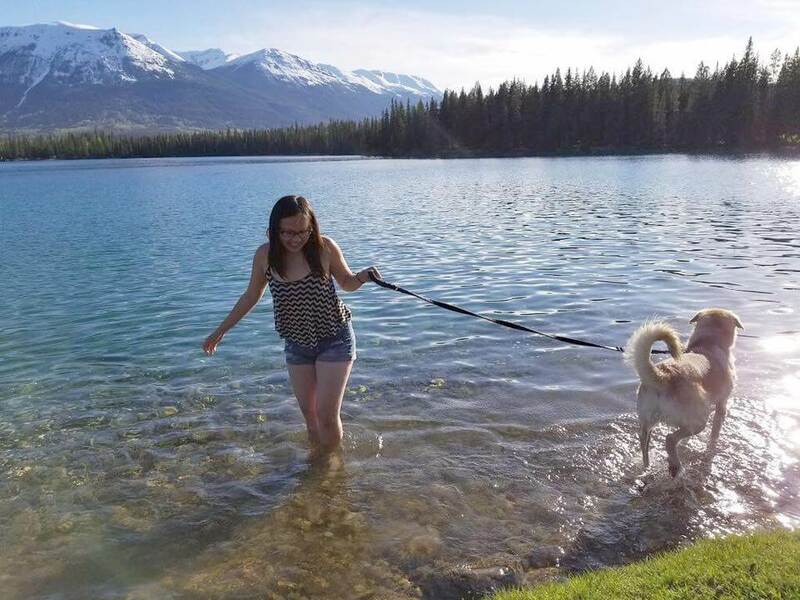 A very outdoorsy vacation all about the dogs! Factor in how much more money you’ll need to pay to accommodate your pooch. All pet-friendly hotels come with additional charges for your pet. There’s extra cleaning involved, extra chances of disturbing other guests, and of course extra risk for damage to the hotel room. Is the additional cost worth it for this particular trip? For reference, here’s the Fairmont’s Pet Policy. 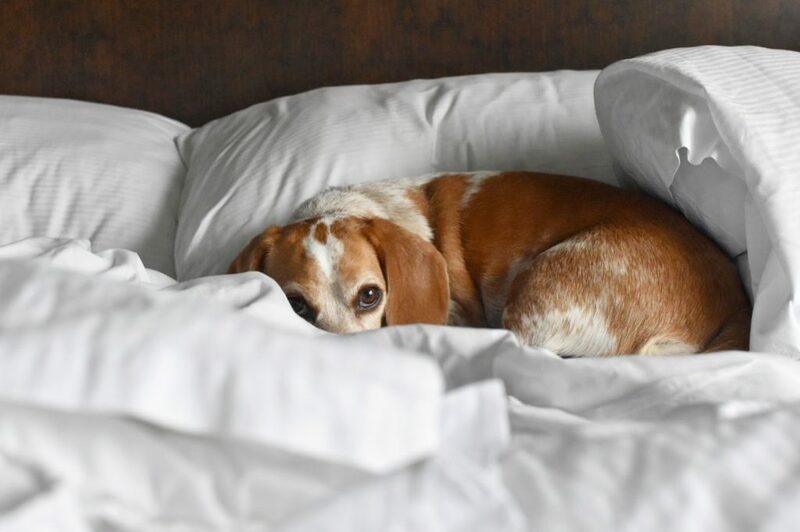 Your dogs can feel right at home at some hotels! Factor in all the extra items you need to pack/lug around with you when you travel with your pets. When we travel with Artie, we need to load his giant kennel. Olive needs her kennel. There’s leashes, dog food and water bowls, treats, toys, blankets, the works. That’s a lot of additional luggage and sometimes that’s just not the vibe you want for your vacay. (Vibe being – feeling that you’re packing and unpacking your entire home into this hotel room lol). 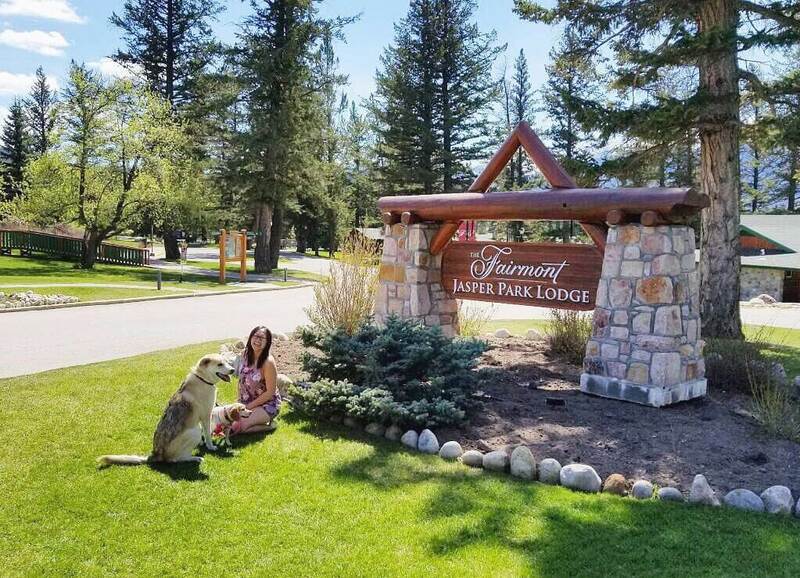 The very dog-friendly Fairmont Jasper Park Lodge with rooms that open up right outside. Factor how much of your holiday should be about your pets and how much should be about you (and relaxing). 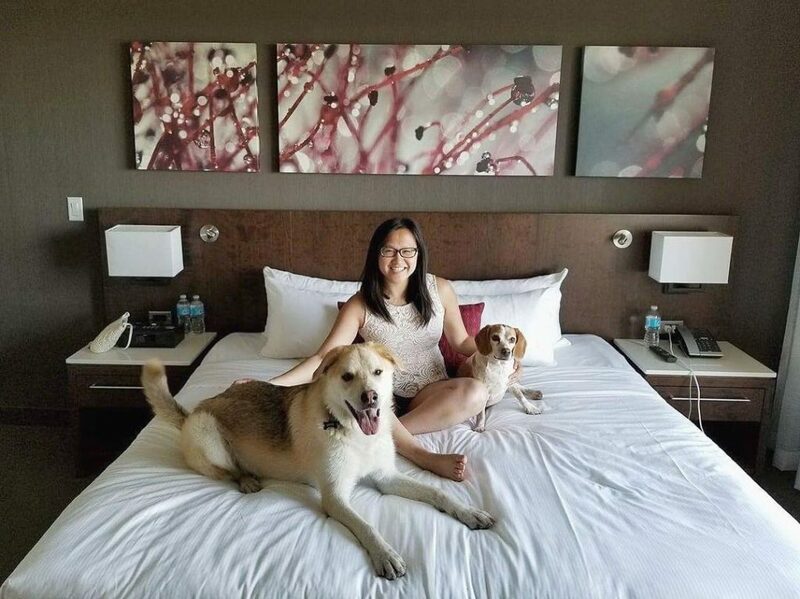 Having your pets with you on vacation is great if planned properly, but even then, when we do leave the dogs in the hotel room alone, I get fairly stressed wondering – Are they barking? Are they scratching up their kennel? Did they have an accident because they’re stressed? Even though our dogs are now pretty used to travel life, you’ll still have these kinds of worries regardless of how well-behaved your pets are. Mike actually doesn’t love taking the dogs with us because of these worries. You have to balance out the pros and cons. A trip where your dogs are involved will be far less care-free than one without them so it’s really more a matter of mixing in dog vacations with non-dog vacations so you’re balancing the ability to fully relax vs. that awful away-from-pets ache. Finally, I would just add that no matter HOW well-behaved your dog is, always, always lock them up in a smaller room (if possible, the bathroom) and inside their kennel when you leave them alone in a place that’s not your home. It’s just not worth the extra headaches if something were to go wrong! So have you had good experiences travelling with your pet?? Any tips or factors to consider that I’ve missed? 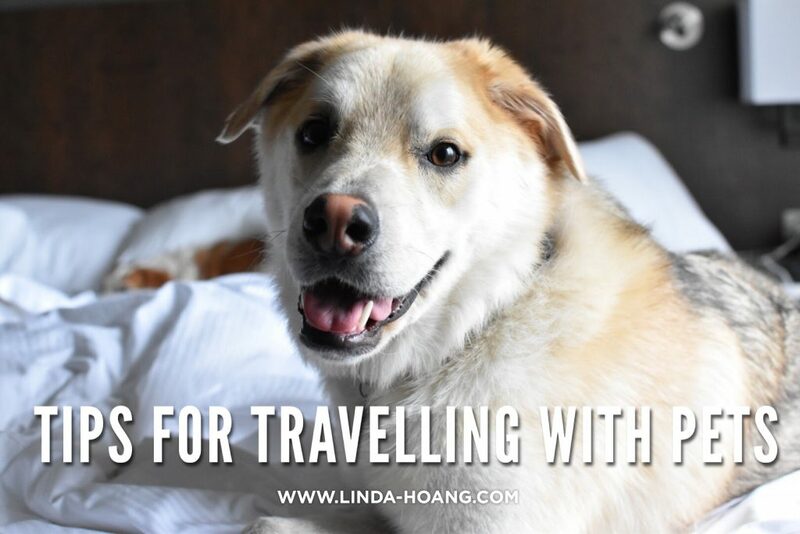 Pin + share my list of tips for travelling with pets!